He's so conflicted. He feels like he's tainted her with his darkness. His angel who he loves so much. He doesn't deserve her he thinks. He doesn't deserve her light. Why can't these words ever come out right? 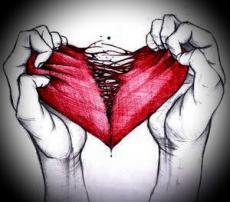 I wanted to say "I love you" but ended up starting a fight..
You cared but I don't know why.. I see it in their faces whenever I walk down the street.. In more way than I'm ever going to admit to. But how can I say that now when I've committed such a horrible crime..
© Copyright 2019 OxannaRose. All rights reserved. The Word- from the book "Realization"
And This is How it All Ends. Reflections of the Past, Love.